Most animal cells release materials into the extracellular space. The primary components of these materials are glycoproteins and the protein collagen. Collectively, these materials are called the extracellular matrix (Figure 16). Not only does the extracellular matrix hold the cells together to form a tissue, but it also allows the cells within the tissue to communicate with each other. Figure 16 The extracellular matrix consists of a network of substances secreted by cells. Blood clotting provides an example of the role of the extracellular matrix in cell communication. When the cells lining a blood vessel are damaged, they display a protein receptor called tissue factor. 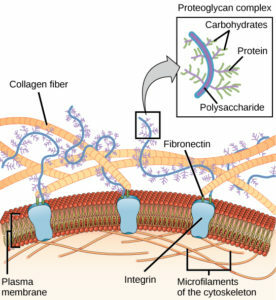 When tissue factor binds with another factor in the extracellular matrix, it causes platelets to adhere to the wall of the damaged blood vessel, stimulates adjacent smooth muscle cells in the blood vessel to contract (thus constricting the blood vessel), and initiates a series of steps that stimulate the platelets to produce clotting factors. In general, long stretches of the plasma membranes of neighboring plant cells cannot touch one another because they are separated by the cell walls surrounding each cell. 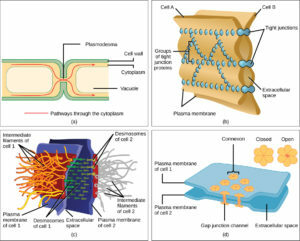 Plasmodesmata are numerous channels that pass between the cell walls of adjacent plant cells, connecting their cytoplasm and enabling signal molecules and nutrients to be transported from cell to cell (Figure 17a). A tight junction is a watertight seal between two adjacent animal cells (Figure 17b). Proteins hold the cells tightly against each other. This tight adhesion prevents materials from leaking between the cells. Tight junctions are typically found in the epithelial tissue that lines internal organs and cavities, and composes most of the skin. For example, the tight junctions of the epithelial cells lining the urinary bladder prevent urine from leaking into the extracellular space. Also found only in animal cells are desmosomes, which act like spot welds between adjacent epithelial cells (Figure 17c). They keep cells together in a sheet-like formation in organs and tissues that stretch, like the skin, heart, and muscles. Gap junctions in animal cells are like plasmodesmata in plant cells in that they are channels between adjacent cells that allow for the transport of ions, nutrients, and other substances that enable cells to communicate (Figure 17d). Structurally, however, gap junctions and plasmodesmata differ.